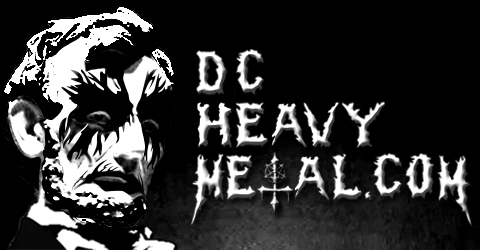 Listen up folks, there’s a new ticket contest on DCHeavyMetal.com! This time you can win a free pair of tickets to see the French shoegaze/black metal band Alcest play at DC9 on Thursday 29 March 2012. To enter just leave a comment on this post telling me why you are excited to see this show. At 5pm EST on Tuesday the 27th of March a winner will be picked at random (using Random.org) from all valid entries. Make sure you enter in a valid email address you check regularly when you submit your comment so I can contact you if you win, though it doesn’t need to be in the comment itself. Don’t be a jerk and enter multiple times or I’ll disqualify all of your entries. And please don’t enter if you can’t make it to the show. If you don’t want to wait to see if you win or this contest is already over when you read it, you can get tickets from Ticket Alternative here for $12. 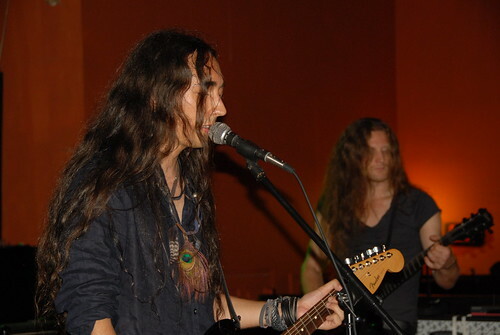 Alcest is probably the most famous of the bands who have started meshing black metal with the atmosphere of shoegaze and when I saw them open for Enslaved at Jaxx last September I was very impressed with their performance. They just put out an excellent new album, Les Voyages de l’Âme, in January so this set should feature some of that new material including the song you can hear in the video at the end of this post. The supporting act on this tour, deafheaven, fits perfectly on this tour since they play a similar style of music, though they are based out of San Francisco. There are two local support bands playing as well. One is Black Clouds, which, from the one song they have on their Facebook page, sounds like a pretty straight up shoegaze band. And the local act that will be opening the show is Auroboros, one of the DC area’s best up and coming metal bands. They’re not atmospheric like the other bands on this line up but they’re really great live and you’d be stupid to miss getting to this show early enough to see these guys. All around, this is a great show coming to one of the smaller venues in the city, DC9, at 1940 9th St NW, Washington, DC 20001 which is located about a block away from the 9:30 Club. Now check out this latest video by Alcest and enter the contest! Deafheaven should be super raw and evil. I really want to see them. This will probably be the only time I can see this band in the US. I’m really excited to see Deafheaven, too. I’m a big fan of this branching out of black metal. I would love to go to this show! The idea of a death metal band from Europe that’s NOT from Scandinavia seems pretty damn cool to me (no offense to those dudes, btw, they’re good too). Plus, Auroboros put on a great show as well! You’re the winner of the free tickets to see Alcest! Great bands, and probably the closest I’ll ever get to seeing anything Peste Noire related live. So does the rest of the bands!!!! I have been wanting to see Alcest since I first heard Souvenirs soon after it came out and as far as I know, this is the first headlining show they’ll play in DC. Nope, maybe they have a metal site in the Windy City that gives away tickets, I have no idea though. 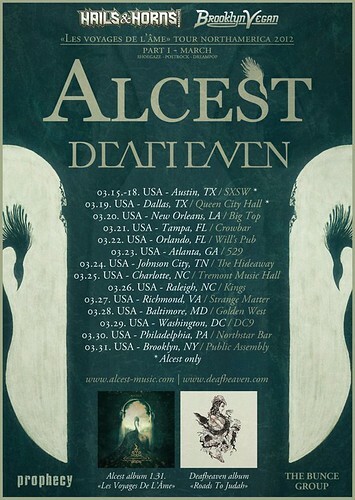 dying to see alcest again, and hear their new material live. i think it’s a rare opportunity to see them actually doing a headlining tour. Hi Chris, I’d like to see Alcest mainly due to your glowing review! Never seen them before but with your recommendation, I know it’s a band I want to see. I demand these tickets so I can finally see the DC area’s best metal band, Auroboros. A friend recently saw Deafheaven and said they’re great live. Wanna check them out. Thanks. When I was a little girl in Panama, a rich American came to our town and he was listening to the most beautiful shoegaze metal. I said to him, “what do you call this most beautiful sound?”, and he said “they call it Alcest”. I repeated the words “Alcest, Alcest”. I asked if I could have it, and he said “No. Get away from me.” Then he started walk away. But I grabbed onto his leg screaming for him to give me the Alcest and he dragged me through the street. And then he kicked at me with the other foot and threw some change at me. Oh, but I didn’t want the change, Chris. I wanted the Alcest. I missed the show at Jaxx last year and I heard it was a Great perform .I dont want to miss it again ,Will be very nice to win the tix to go with my boy! !